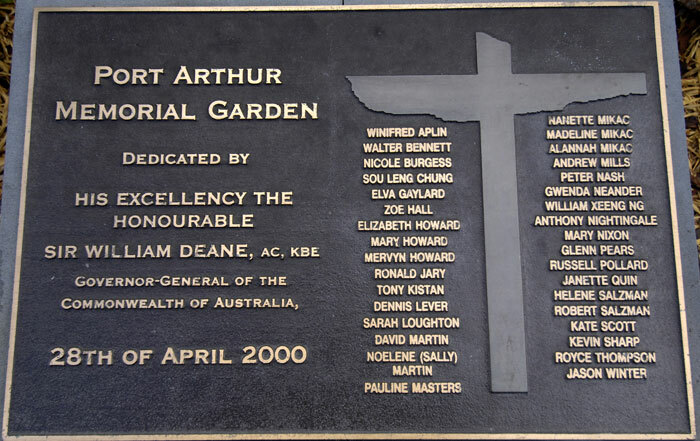 This plaque naming those visitors, staff members and locals killed on April 28, 1996, was unveiled in a new reflection garden at Port Arthur four years after the tragedy. Yet, even two decades on, Australia’s media remain largely focused on the deeds of the perpetrator rather than on the remarkable strength and resilience that has been shown by the thousands of people who survived – or responded to – this ordeal. TRIGGER WARNING: Specific news and current affairs coverage of multiple-death crimes, including Australia’s 1996 massacre in Tasmania and Norway’s 2011 killing rampage in and around the town of Utoya, will be discussed and linked to in this article. Should you find the content distressing or that it triggers an unwanted or unexpected reaction, please consult with a trained health professional or call Lifeline on 13 11 14. March 16, 2016: Very often, when news media blatantly use sensationalism in order to boost ratings or circulation, immense harm can be – and is – done, and not just to a few individuals in their audiences. There is evidence of it most days on TV screens, in newspapers and online, generally in the form of particularly ‘confronting’ visual snippets from traumatic news coverage, spliced together to prove this news organisation is ‘all over the news of the day’. It’s just too bad if that re-exposes – without warning – children, parents or partners of crime or disaster victims to their personal tragedy. Elsewhere it’ll be the news coverage itself, often produced to a formula, regardless of the uniqueness of a particular incident. However – because any additional harm this causes often remains distant to those in the newsroom or is not evident to those making critical content decisions – not only do these journalists miss important cues or clues but they also diminish the respect and trust of their public which, ultimately, pays out in long-term audience depletion. But cultural change can prove glacially slow and elusive, especially in newsrooms where adrenaline and audience numbers often overshadow sensitivity and compassion. Among those directly affected – as well as experts and sympathetic members of the public – the name and nature of this crime’s surviving perpetrator, Martin Bryant, still has far too much media currency, despite the pain that this continues to cause so many people. 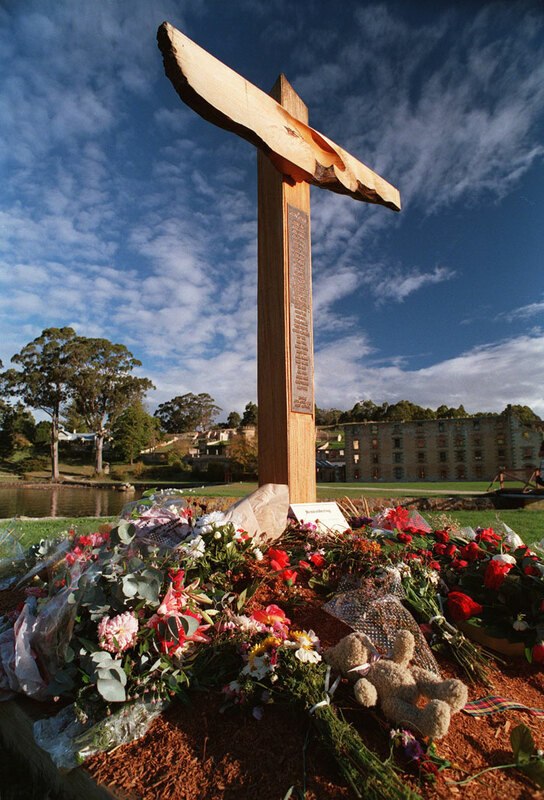 The original memorial cross was positioned at the neck of the harbour at Port Arthur until a more permanent site could be completed, next to the ruins of the nearby Broadarrow Cafe. For those unfamiliar with this massacre in a picturesque corner of Australia’s island state of Tasmania, there were more than 700 adults and children at the popular Port Arthur Historical Site just after lunch on April 28, 1996, most were day-trippers and the rest staff and locals. They had to dive for cover and hundreds remained trapped, ordered to keep silent for many hours until police could assure them the shooting was over and it was safe to come out. Those who had been working at the site that day were not always able to hide. They found themselves responding to the injured and dying until help would arrive at least 90 minutes after the first shots were fired. Those living on the surrounding Tasman Peninsula – a population of 2000+ at the time – were also frozen in fear, as soon helicopters were circling endlessly overhead as a frantic police search to track down and corner the perpetrator continued for hours, into the night, while everyone remained uncertain about the fate of their loved ones. Every single one of the dead and injured had a frantically worried circle of family, friends and colleagues. Bryant’s deadly rampage spanned at least three close locations, ending in a fiery confrontation with police more than eight hours later at the Seascape guesthouse where he’d earlier murdered its owners before heading to the historic site. That day, visitors, workers and residents alike lost children, partners, parents, nieces, nephews, neighbours, workmates, travel companions and friends. Some lost more than one person. Many were eyewitnesses to the shootings and faced the prospect of having to give evidence in court. Despite demonstrating enormous resilience, injured survivors – and their loved ones – continue to live with the physical and mental scars inflicted that day. Like a pebble striking a pond, the impact of this crime spread almost instantly across the state, the nation and to overseas countries from where some of the site’s visitors had come. Yet, as the full horror of the massacre unfolded, newsrooms around the world responded predictably, ‘hyperfocusing’ on the crime and its perpetrator over the coming days, weeks, months and years. This largely overlooked the fallout from his actions and, in due course, it skimmed over the terrific struggle to rebuild shattered lives, communities and Tasmania’s tourism industry after the court process ended*. Bryant, who only changed his plea to guilty after the trial got under way, ultimately received 35 consecutive life sentences, effectively jailing him for the rest of his days. Two decades on, sadly, it seems little has changed when it comes to news and current affairs media revisiting this massacre. Disrespect for the living goes on while the heroic but still painful recovery of those affected, and the valiant rebuilding of their families and communities remains almost invisible. Media are approaching survivors, getting them to rehash exquisitely painful memories, uncovering aspects of the crime “never before aired”, but few in the media are moving on with the story, telling the far braver story about how a community and individuals recover from such horrendous violence. For example, the Seven Network promoted the daylights out of its ‘chilling (previously unseen outside a courtroom) video of police interviews with Australia’s worse mass murderer’ as well as Mike Willesee’s ‘exclusive interviews’ with the perpetrator’s former defence lawyer, a forensic psychiatrist and a retired detective. 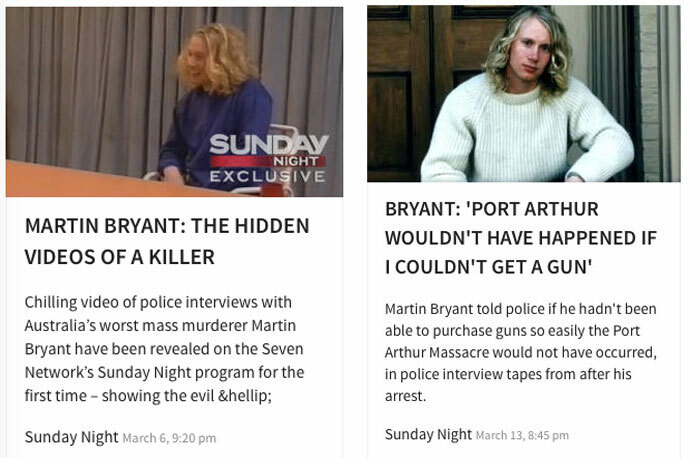 How the Seven Network promoted its two “exclusive” Sunday Night programs that aired on March 6 and March 13, 20 years after Australia’s worst mass killing. With what seems scant thought for those thousands of individuals living with the consequences of this crime, those programs aired over two weekends on the network’s Sunday Night current affairs program, on March 6 and March 13, six weeks ahead of the April 28, 20-year commemoration of the horrific crime that scarred a nation. But Seven’s on-air promotions for these programs endlessly ‘titillated’ audiences during prime time in the week running up to those air dates in an obvious quest for eyeballs. For anyone with even the slightest understanding of the personal, social and ongoing impact of this crime, Seven’s first program was an appalling affront to survivors and their loved ones. It focused on a ‘smiling and giggling’ Bryant being interviewed by detectives in the days after the incident, an individual who many directly affected will have desperately tried to forget. It featured numerous ‘insights’ from Bryant’s defence lawyer, who – years after the case concluded – was himself jailed and disbarred for professional fraud. The only nod to the enormous harm Bryant had done was a rolling list in the closing moments of the first instalment that included the names and images of the 35 who died that day – as if that was the full extent of respect being paid to the massacre’s impact. From the Seven Network’s web page summarising the content of its second “exclusive” Sunday Night programs. A week later it was more of the same: how easily Bryant had managed to acquire his arsenal of powerful semi-automatic weapons he used to mow down his victims; how one of his guns was identical to that used in the Sandy Hook massacre; and the rekindling of public doubt that Bryant had even been mentally fit enough to face court. On Twitter, however, Seven’s sensationalism was both called out for what it was, especially its use of a discredited defence lawyer. What just some displeased viewers had to say on Twitter about Sunday Night’s ‘sensational’ coverage that focused on the massacre’s perpetrator. On Sunday Night’s own Facebook page, its coverage – rather than tamp down speculation around the events of that day – gave oxygen to strident conspiracy theorists, who had a field day, nit-picking details and re-circulating ill-founded beliefs. Yet other, poignant reactions on Facebook should give Sunday Night’s producers – and other media – more than a little pause for thought. What sympathetic viewers had to say to Seven on its Facebook page. But was anyone at the network listening? Airing such footage, some argue, showed the nature of the man, his intellect, his acknowledgment of his actions and that he admitted to acting alone, discounting the slew of conspiracy theorists, and his own mother, who have speculated otherwise. Other major news outlets linked heavily to these programs – including news.com.au on at least three occasions (on March 7, March 8 and March 14) and Fairfax websites (a Seven-provided trailer on March 4 plus a review of episode 1 on March 7) – again focusing on superficial, ‘sensational’ details. In reality, the airing of Bryant’s taped evidence – whether viewed or not, because it will certainly come up in private conversations – merely tears open painful wounds for those with a real, lifetime connection to this horrific event. Contrast this to a recent collective decision by Norwegian media – reported by The Guardian on March 16 of this year – to not air testimony about to be given by mass murderer Anders Breivik’s appeal ‘out of respect for the victims’. Indeed, Norway’s experience has other important lessons to share with Australian media. An excerpt from The Guardian’s reportage of Norway’s collective media decision not to air Breivik’s evidence to his legal appeal. In the years after that 2011 northern hemisphere killing spree, after surveying hundreds of journalists, Norwegian researchers Trond Idås and Klas Backholm found that journalists who felt that their reporting may have caused harm were themselves at higher risk for post-traumatic stress disorder. Meanwhile, as the 20-year milestone of the Tasmanian massacre approaches, the dilemma of how to package and present stories remains. For instance, when the considered insights of Walter Mikac – whose wife and young daughters were gunned down – were paired online with a 1996 video news clip that is likely to drag viewers who may also be survivors back to the horrors of that day, it shows that newsrooms still do not understand the impact of trauma and the potential for ongoing harm when such elements are republished. Having worked as a journalist and having done extensive research about aspects of journalism and trauma around this particular incident, I watched both of Seven’s ‘major event’ programs carefully. Initially, I shook my head at how they played out. But, a few days on, I now wonder whether any lessons learned in the interim had been lost by less obvious factors, such as newsroom turnover or the departure – or ignoring – of those journalists who had learned a better way to report such tragedies but were unsuccessful in convincing their office-bound bosses. Trina McLellan, speaking of those affected by the 35 shooting deaths at Port Arthur, as quoted in Sonya Voumard’s book, The Media and the Massacre. Ripples from the impact of the massacre also touched those who responded in its aftermath, including journalists. Also, many journalists who covered the Tasmanian Peninsula massacre, especially those who continued to do so for months and years afterwards, also carry psychological and emotional scars that will prickle this year at insensitive coverage. They, at least, have some comprehension of the complexity of matters at play on both sides of the story. If they’ve been unable to change journalistic practice among peers, then their frustration level will be elevated. The reality is that, in 1996 and for some years after, research and knowledge around best practice reporting of traumatic incidents was pretty scarce. But the body of knowledge is now not only considerable but also considered essential learning for responsible journalists. Despite such widespread availability of intelligence and training, a colleague recently encountered a domestic violence victim who was shot by her husband, causing her leg to be amputated, before he shot their two children and then took his own life. The victim recalled that when a young journalist had asked when that had happened and was told it had happened 10 years earlier, the journalist simply ‘waved her away’, saying it was ‘too long ago to report’. Such accounts merely underscore the residual ignorance around the impact of trauma on victims and survivors, who – almost exclusively – wish journalists no harm but who quickly become wary of all news media after being treated insensitively. * Another Australian journalist-researcher, Sonya Voumard, also discusses at length media behaviour around the massacre at Port Arthur in her new book, The Media and the Massacre – disclosure: Trina McLellan has been quoted in this book – and Ms Voumard was interviewed on March 24, 2016, about the media’s coverage of the massacre on ABC Radio National’s Life Matters. Trina McLellan is a freelance journalist, researcher and educator. From 2004-2009 she was a founding board member of the Dart Centre for Journalism and Trauma – Australasia (now the Dart Centre Asia Pacific). 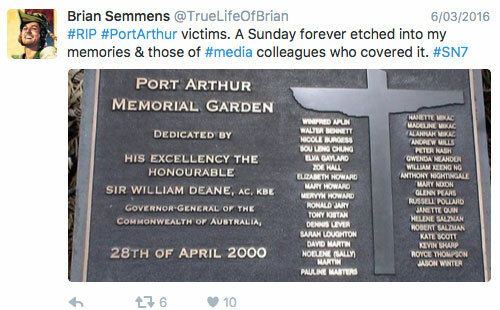 A significant proportion of her 2003 MA thesis, The impact of news reporting on victims and survivors of traumatic incidents, examines in detail the reactions and insights of those directly affected by media coverage of the Port Arthur massacre. A decade ago, she wrote about this same topic ahead of the 10-year commemoration and she has written about the beauty of the Port Arthur Historical Site itself. NOTE: This article was originally written on March 16, 2016, and updated on April 11, 2016.